Nicole Mills Photography. Photograph her today, and have an heirloom forever! Photographer her today, and have an heirloom forever! I recently invested in this absolutely gorgeous Anna Triant couture gown. If you're not familiar with her gowns, you should take a moment to check out her other fabulous designs. Once I photographed my own daughter in this wondrous creation, I knew I had to keep it so I could offer it to other little girls that would want to twirl their little hearts away in it! And if you want to see your daughter looking like the sweet innocent child she is, but you'd also like to get a glimpse of the beautiful woman she's to become, I'm certain the images of her in this gown that I can create for you will accomplish this! This beautiful gown will fit most girls between the ages of 6 & 8 years old, depending on build. 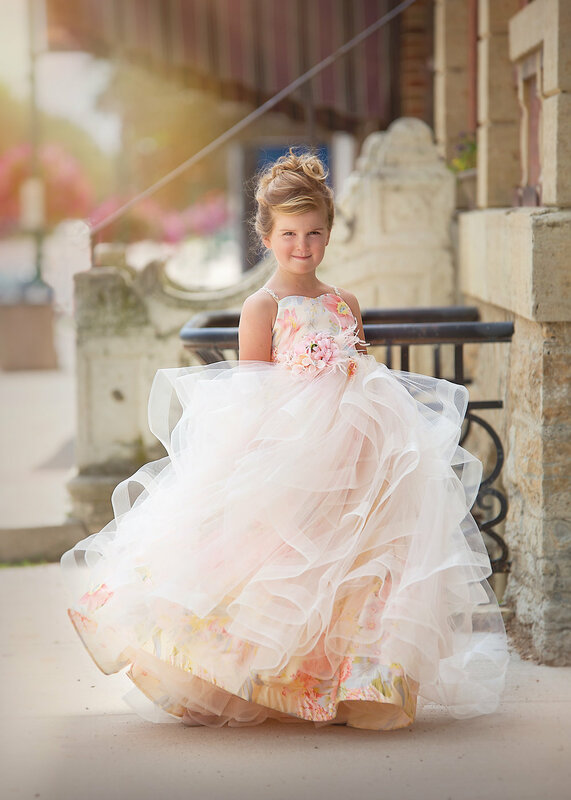 I do have many other beautiful dresses and tulle skirts in various sizes that can be chosen by your daughter, should this gown not be the right fit for her. Digital copies of your 4 images, w/print release included. These images were taken right outside my studio doors. My studio is housed in the 1895 L.F. Irish building at 222 S. Main St. in Pine Island. It's an amazing location, filled with both intriguing indoor & outdoor locations for photographs. All images will be taken here, unless other arrangements have been made ahead of time. Your daughter's session will be approximately 30 minutes long, once we have her dressed and ready to be photographed. After her session, I will review and choose the four best images to edit. Within a week, I will be in touch to schedule a time for you to pick up your images. $100 is due at the time of booking to hold your session time. The balance of $300 is due when you pick up your images. You are under NO obligation to purchase your images. Only buy them if you LOVE them! Each of the four images will be printed at 7 x 10 and will be matted to fit an 11 x 14 frame. If you know ahead of time that you may like larger sizes, please let me know and I will provide prices for larger prints and/or canvases. You will also receive the matching sized digital files to your printed images, along with a print release. Once images are paid for and leave my studio, all sales are final. In the event you LOVE your images and wish to purchase more, we can make arrangements to have you view additional images you may choose to have me edit and they will be delivered in the same manner as mentioned above. The tulle on this dress is in luxurious panels from front to back. It's layered to add volume, and when your little girl gives it a twirl she'll be feeling like the princess she is and always will be! Made of silk, the main fabric of this gown is stunning. Soft to the touch and covered with beautiful flowers. A beautiful floor long ball-gown skirt with mesh netting underneath for volume and shape. On the back of the dress is a beautiful bow made from the same silk of the gown, and once tied sits right at waist level. On the front, a beautiful bouquet of flowers sits just off center to provide the final amazing touch to this magical silhouette. A parent or guardian of each child photographed will be required to sign the standard Nicole Mills Photography contract at the time of their session. All images are copyrighted by Nicole Mills Photography.